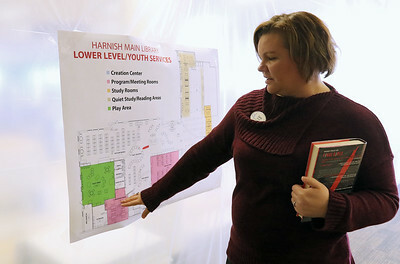 Matthew Apgar - mapgar@shawmedia.com Executive Director Sara Murray points out some of the improvements being made to the Algonquin Area Public Library Harnish Main Library branch on Friday, March 16, 2018 in Algonquin. 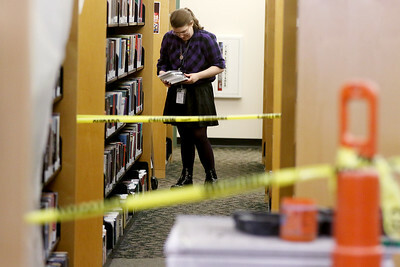 Matthew Apgar - mapgar@shawmedia.com Denise Majka shelves books in an aisle near one closed off for construction at the Algonquin Area Public Library Harnish Main Library branch on Friday, March 16, 2018 in Algonquin. Matthew Apgar - mapgar@shawmedia.com Gina Cafferata leads Vanessa Smith, 2, out of the new Creation Center before story time at the Algonquin Area Public Library Harnish Main Library branch on Friday, March 16, 2018 in Algonquin. 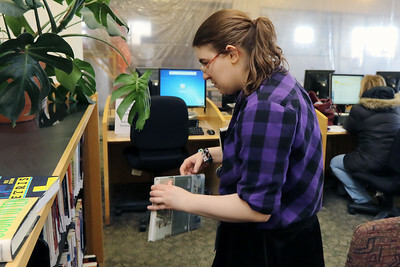 Matthew Apgar - mapgar@shawmedia.com Makayla Gibbs shelves magazines which have found a new home in a quiet room at the Algonquin Area Public Library Harnish Main Library branch on Friday, March 16, 2018 in Algonquin. 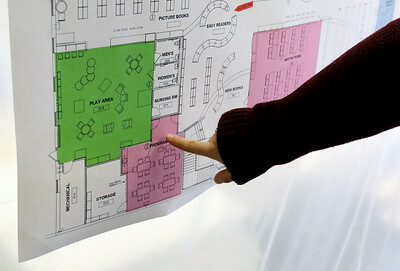 Matthew Apgar - mapgar@shawmedia.com Workers continue construction at the Algonquin Area Public Library Harnish Main Library branch on Friday, March 16, 2018 in Algonquin. 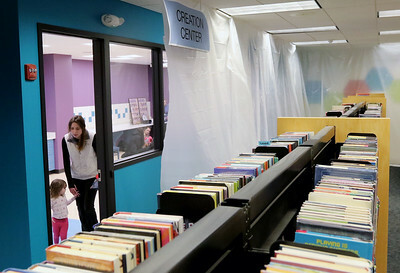 Matthew Apgar - mapgar@shawmedia.com Denise Majka files away books near patrons using computers with a transparent construction tarp hanging from the ceiling at the Algonquin Area Public Library Harnish Main Library branch on Friday, March 16, 2018 in Algonquin. 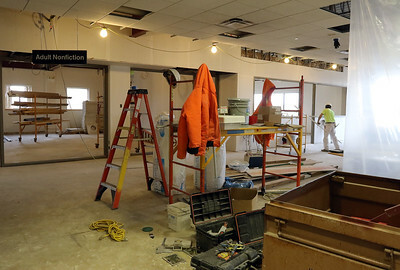 Workers continue construction at the Algonquin Area Public Library Harnish Main Library branch on Friday, March 16, 2018 in Algonquin.